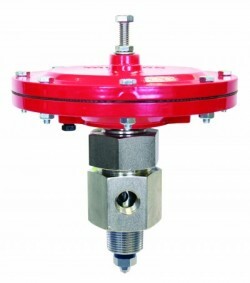 The DVU Series are pneumatically controlled dump valves. The valves open and close automatically by pneumatic control from a FW Murphy level controller and dump valve operator. Diaphragm actuated, the DVU series dump valves operate at 30–70 psi (207–483 kPa) [2.07–4.83 bar] and up to 2000 psi (13.8 MPa) [138 bar] vessel pressure (depending on the model). A key benefit of this design is a hex union that provides the ability to replace the seat without removing the valve from piping. Designed for gas compressor scrubbers, the DVU Series can be used to dump any liquids compatible with its materials of construction. DVU150 and DVU175: 1800 psi (12.4 MPa) [124 bar]. DVU2105: 500 psi (3.44 MPa) [34 bar]. DVU2115: 1500 psi (10.3 MPa) [103 bar]. DVU2120: 2000 psi (13.8 MPa) [138 bar]. DVU150 and DVU175: 9 lbs. (4 kg.). Shipping Dimensions: 8 x 8 x 12 in. (203 x 203 x 305 mm.). DVU Selection Guide (.zip, 327KB) - The DVU Selection Guide selects the appropriate dump valve model for the user using a series of calculations. This calculation is obtained after the user inputs application information such as diameter of vessel, duration of dump cycle, vessel pressure and pressure at outlet of DVU.